So, what will happen if you use this method? So what does a Merkle Tree have to do with blockchains? 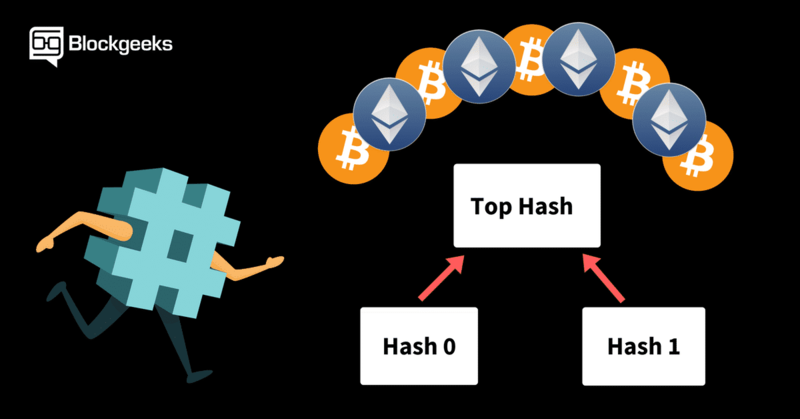 It is important to know how blockchain Hashing works. In order to do that, however, we need to first understand one of the core principles that go into blockchain creation. Blockchain technology is one of the most innovative and era-defining discoveries of the past century. Seeing the influence it has had over the last few years and the impact that it will have in the future, it surely isn’t an exaggeration to say that. In order to understand how various cryptocurrencies like Ethereum and Bitcoin function. Let’s see how the hashing process works. We are going put in certain inputs. For this exercise, we are going to use the SHA-256 (Secure Hashing Algorithm 256). As you can see, in the case of SHA-256, no matter how big or small your input is, the output will always have a fixed 256-bits length. This becomes critical when you are dealing with a huge amount of data and transactions. So basically, instead of remembering the input data which could be huge, you can just remember the hash and keep track. 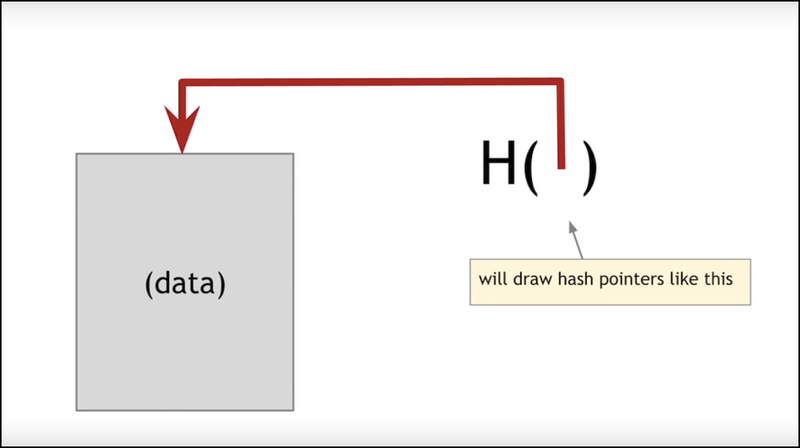 Before we go any further we need to first see the various properties of hashing functions and how they get implemented in the blockchain. A cryptographic hash function is a special class of hash functions which has various properties making it ideal for cryptography. There are certain properties that a cryptographic hash function needs to have in order to be considered secure. Let’s run through them one by one. This means that no matter how many times you parse through a particular input through a hash function you will always get the same result. This is critical because if you get different hashes every single time it will be impossible to keep track of the input. The hash function should be capable of returning the hash of an input quickly. If the process isn’t fast enough then the system simply won’t be efficient. What pre-image resistance states is that given H(A) it is infeasible to determine A, where A is the input and H(A) is the output hash. Notice the use of the word “infeasible” instead of “impossible”. We already know that it is not impossible to determine the original input from its hash value. Let’s take an example. Suppose you are rolling a dice and the output is the hash of the number that comes up from the dice. How will you be able to determine what the original number was? It’s simple all that you have to do is to find out the hashes of all numbers from 1-6 and compare. Since hash functions are deterministic, the hash of a particular input will always be the same, so you can simply compare the hashes and find out the original input. But this only works when the given amount of data is very less. What happens when you have a huge amount of data? Suppose you are dealing with a 128-bit hash. The only method that you have to find the original input is by using the “brute-force method”. Brute-force method basically means that you have to pick up a random input, hash it and then compare the output with the target hash and repeat until you find a match. Best case scenario: You get your answer on the first try itself. You will seriously have to be the luckiest person in the world for this to happen. The odds of this happening are astronomical. Worst case scenario: You get your answer after 2^128 – 1 times. Basically, it means that you will find your answer at the end of all the data. Average scenario: You will find it somewhere in the middle so basically after 2^128/2 = 2^127 times. To put that into perspective, 2^127 = 1.7 X 10^38. In other words, it is a huge number. So, while it is possible to break pre-image resistance via brute force method, it takes so long that it doesn’t matter. Property 4: Small Changes In The Input Changes the Hash. Given two different inputs A and B where H(A) and H(B) are their respective hashes, it is infeasible for H(A) to be equal to H(B). What that means is that for the most part, each input will have its own unique hash. Why did we say “for the most part”? Let’s talk about an interesting concept called “The Birthday Paradox”. If you meet any random stranger out on the streets the chances are very low for both of you to have the same birthday. In fact, assuming that all days of the year have the same likelihood of having a birthday, the chances of another person sharing your birthday is 1/365 which is a 0.27%. In other words, it is really low. However, having said that, if you gather up 20-30 people in one room, the odds of two people sharing the exact same birthday rises up astronomically. In fact, there is a 50-50 chance for 2 people of sharing the same birthday in this scenario! Why does that happen? It is because of a simple rule in probability which goes as follows. Suppose you have N different possibilities of an even happening, then you need square root of N random items for them to have a 50% chance of a collision. So applying this theory for birthdays, you have 365 different possibilities of birthdays, so you just need Sqrt(365), which is ~23~, randomly chosen people for 50% chance of two people sharing birthdays. What is the application of this in hashing? Suppose you have a 128-bit hash which has 2^128 different possibilities. 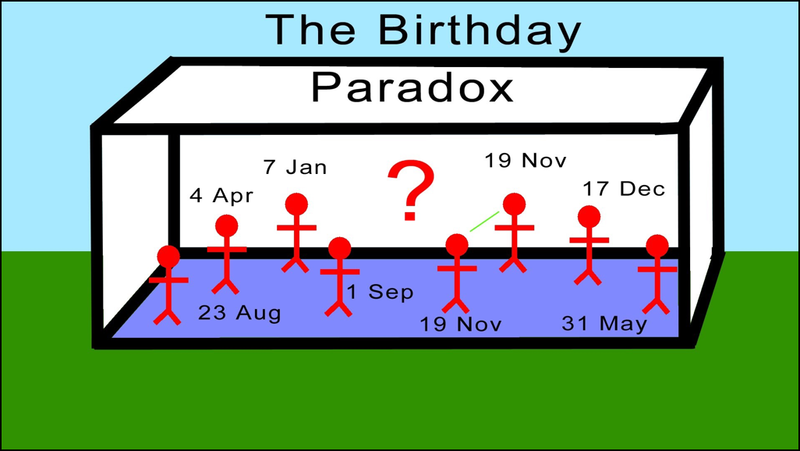 By using the birthday paradox, you have a 50% chance to break the collision resistance at the sqrt(2^128) = 2^64th instance. As you can see, it is much easier to break collision resistance than it is to break preimage resistance. No hash function is collision free, but it usually takes so long to find a collision. So, if you are using a function like SHA-256, it is safe to assume that if H(A) = H(B) then A = B. Now, this is a fascinating property, and the application and impact that this one property has had on cryptocurrency are huge (more on that later when we cover mining and crypto puzzles). First let’s define the property, after that we will go over each term in detail. For every output “Y”, if k is chosen from a distribution with high min-entropy it is infeasible to find an input x such that H(k|x) = Y. That probably went all over your head! But it’s ok, let’s now understand what that definition means. What is the meaning of “high min-entropy”? It means that the distribution from which the value is chosen is hugely distributed so much so that us choosing a random value has negligible probability. Basically, if you were told to chose a number between 1 and 5, that’s a low min-entropy distribution. However, if you were to choose a number between 1 and a gazillion, that is a high min-entropy distribution. The “|” denotes concatenation. Concatenation means adding two strings together. Eg. If I were to concatenate “BLUE” and “SKY” together, then the result will be “BLUESKY”. So now let’s revisit the definition. Suppose you have an output value “Y”. If you choose a random value “k” from a wide distribution, it is infeasible to find a value X such that the hash of the concatenation of k and x will give the output Y. Once again, notice the word “infeasible”, it is not impossible because people do this all the time. In fact, the whole process of mining works upon this (more on that later). MD 5: It produces a 128-bit hash. Collision resistance was broken after ~2^21 hashes. SHA 1: Produces a 160-bit hash. Collision resistance broke after ~2^61 hashes. SHA 256: Produces a 256-bit hash. This is currently being used by Bitcoin. Keccak-256: Produces a 256-bit hash and is currently used by Ethereum. 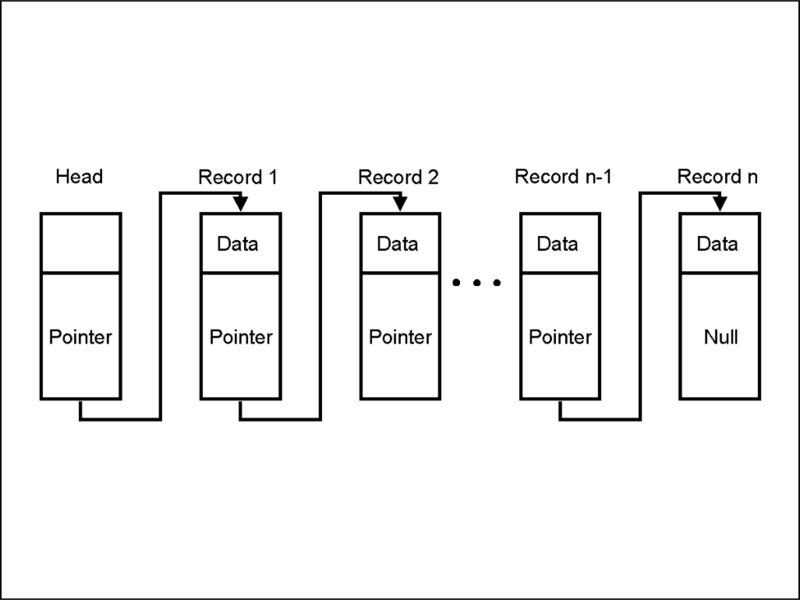 Pointers are variables in programming which stores the address of another variable. Usually normal variables in any programming language stores data. Eg. int a = 10, means that there is a variable “a” which stores integer values. In this case, it is storing an integer value which is 10. This is a normal variable. Pointers, however, instead of storing values will store addresses of other variables. Which is why they are called pointers, because they are literally pointing towards the location of other variables. It is a sequence of blocks, each containing data which is linked to the next block via a pointer. The pointer variable, in this case, contains the address of the next node in it and hence the connection is made. The last node, as you can see, has a null pointer which means that it has no value. One important thing to note here, the pointer inside each block contains the address of the next block. That is how the pointing is achieved. Now you might be asking what does that mean for the first block in the list? Where does the pointer of the first block stay? If you are wondering what the “hash pointer” means, we will get there in a bit. The blockchain is a linked list which contains data and a hash pointer which points to its previous block, hence creating the chain. What is a hash pointer? 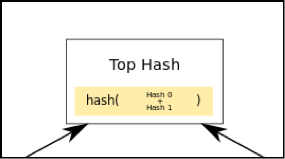 A hash pointer is similar to a pointer, but instead of just containing the address of the previous block it also contains the hash of the data inside the previous block. This one small tweak is what makes blockchains so amazingly reliable and trailblazing. So what does a block header look like? Version: The block version number. The current difficult target. (More on this later). Nonce (more on this later). Right now, let’s focus on the Hash of the Merkle Root. 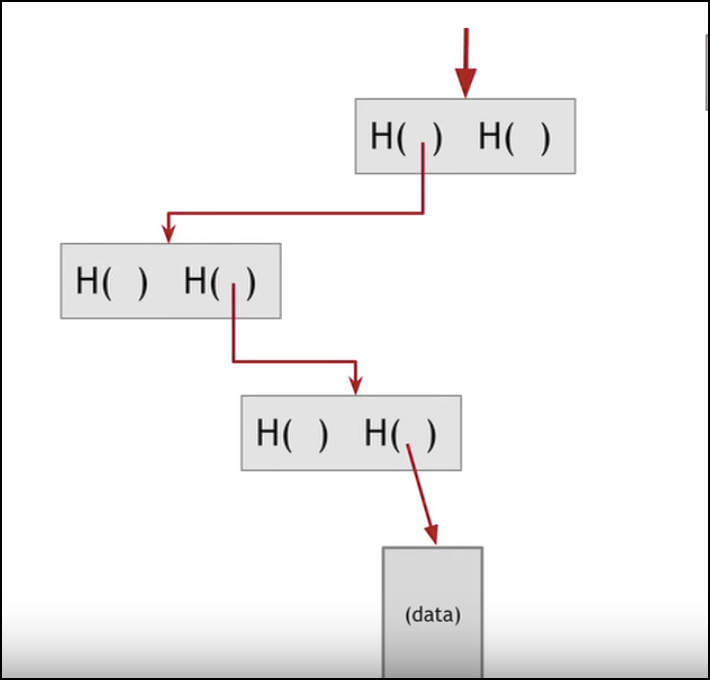 But before that, we need to understand what a Merkle Tree is. 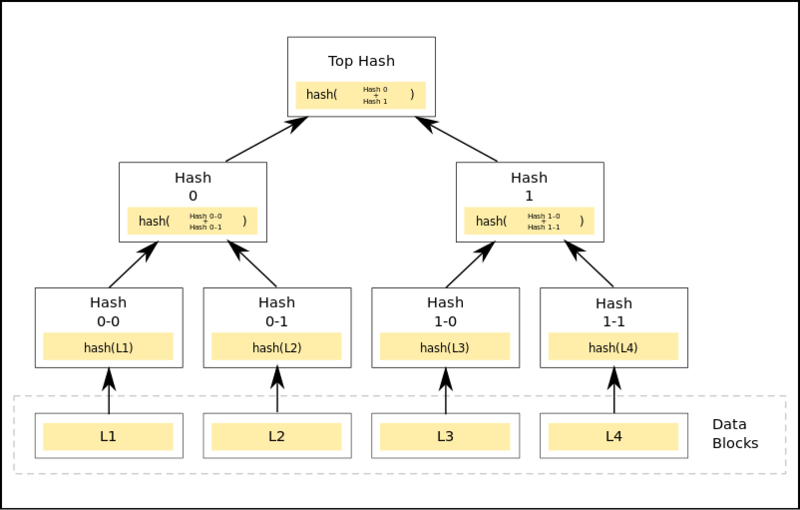 Root Node: The single node on the highest tier labeled “Top Hash” is the root node. Each block contains thousands and thousands of transactions. It will be very time inefficient to store all the data inside each block as a series. Doing so will make finding any particular transaction extremely cumbersome and time-consuming. If you use a Merkle tree, however, you will greatly cut down the time required to find out whether a particular transaction belongs in that block or not. Doing this significantly reduces the time taken. Hashing in mining: The crypto puzzles. When we say “mining”, it basically means searching for a new block to be added in the blockchain. Miners from around the world are constantly working to make sure that the chain keeps on growing. Earlier it used to be easy for people to mine using just their laptops, but over time, people started forming mining pools to pool in their computer powers and mine more efficiently. More collisions: More hash functions will be generated which will inevitably cause more collisions. More orphaned blocks: If a lot of miners are over mining they will come up with new blocks simultaneously. This will result in or more blocks not getting to be part of the main chain and becoming orphan blocks. So, in order to restrict block creation, a specific difficulty level is set. Mining is like a game, you solve the puzzle and you get rewards. Setting difficulty makes that puzzle much harder to solve and hence more time-consuming. WRT bitcoins the difficulty target is a 64-character string (which is the same as a SHA-256 output) which begins with a bunch of zeroes. A number of zeroes increases as the difficulty level increases. The difficulty level changes after every 2016th block. Note: We will primarily be talking about Bitcoin mining here. When the Bitcoin mining software wants to add a new block to the blockchain, this is the procedure it follows. Whenever a new block arrives, all the contents of the blocks are first hashed. If the hash is lesser than the difficulty target, then it is added to the blockchain and everyone in the community acknowledges the new block. However, it is not as simple as that. You will have to be extremely lucky to get a new block just like that. This is where the nonce comes in. The nonce is an arbitrary string which is concatenated with the hash of the block. After that this concatenated string is hashed again and compared to the difficulty level. If it is not less than the difficulty level, then the nonce is changed and this keeps on repeating a million times until finally, the requirements are met. When that happens the block is added to the block chain. The final hash is then compared to the difficulty level and seen whether it’s actually less than that or not. The miners responsible for this are rewarded with bitcoins. Remember property number 6 of hash functions? The puzzle friendliness? The puzzle solving should be difficult. Checking the answer should, however, be easy for everyone. This is done to make sure that no underhanded methods were used to solve the problem. Hash rate basically means how fast these hashing operations are taking place while mining. A high hash rate means more people and software machines are taking part in the mining process and as a result, the system is running smoothly. If the hash rate is too fast the difficulty level is increased. If the hash rate becomes too slow then the difficulty level is decreased. Hashing has truly been fundamental in the creation of blockchain technology. If one wants to understand what the blockchain is all about, they should definitely understand what hashing means. Very nice and easy to understand article. “Sqrt(365), which is ~23~,” How is sqrt(365) ~23~ ? I’m agree that,thanks so much,I was confused when reading it. That’s true. Merkle tree has o(n) search complexity. Thanks for writing, clear and understandable.